Both Majestic Downfall and The Slow Death excel, and deserve equal amounts of credit for their Death/Doom inputs. 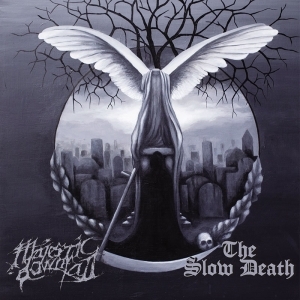 This split, between Majestic Downfall from Mexico and The Slow Death from Australia, consists of heavy and epic Doom/Death Metal. Both projects are filled to the brim with morbid atmosphere, intricate guitar melodies, and intense vocal performances. I was already a big fan of the Aussie recording project, which initially drew me to this recent duo release. However, both bands excel, and deserve equal amounts of credit for their inputs. Majestic Downfall is the one-man project of Jacobo Córdova. His end of the split is more straightforward and aggressive, consistently and neatly balancing out both equations of Doom and Death Metal. Kicking off to an intense start is 'The Dark Lullaby', in which heavy grooves and melancholic leads meet some very desperate and ugly vocals. Think Luc Lemay of Gorguts giving his gnarly screams over to a much more aggressive Anathema, and you’d have a good idea of the monster we’re dealing with here. Driving mid-paced tunes lead to sudden blastbeats, topped off with ultra bleak lead melodies, and the utterly depraved grunts and screams. Though the music is very melodic and has a clean sounding production, it never becomes overly polished or sterile sounding like the plethora of bands who have attempted to recreate 'Brave Murder Day' over the years. It’s still ugly music, and it drips with a perpetual sense of loss and failure, yet it does so with such nice sounding chord progressions that the two seem to find a happy medium between the accessible and the extreme. One aspect of the music that I find especially pleasing is how well the bass stands out with the guitars. I’ve mentioned in past reviews that it is all too easy for the guitars to drown out the bassist, and this is a case where there is a perfect unity between them. Alongside the swaying lead harmonies and aggressive rhythms, the bass provides a deep and booming backbone that really accentuates the music’s ability to balance things out. Overall, the three tracks are refreshing and memorable, filled with catchy hooks, a nice variety of different rhythms, and some truly wonderful melodies. The Slow Death lies more on the Doom side of the equation than Majestic Downfall. The band initially started out as a three-piece, featuring Stuart Prickett, Mandy Andresen, and Gregg Williamson (respectively, of Stone Wings, Murkrat, and Corpsickle). Over time, the line-up doubled, and the music has continued to improve greatly over time. The band is more or less Stuart’s continuation of his work in Stone Wings, and you can definitely detect the similarities over the course of their three songs on this split. 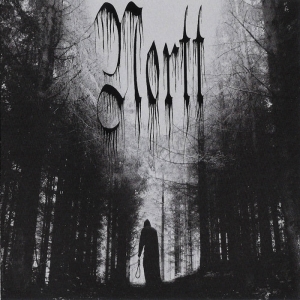 While the band’s previous two albums stood close to the profound Funeral Doom of their country mates Mournful Congregation, this split shows more variation for the band in terms of both rhythm and style. 'Criticality Incident I' and 'II' showcase their more epic side, consisting of the band’s heaviest and most aggressive riffs so far. As the guitars range from desolate funereal drags to uplifting bursts of Melodic Death Metal, the solemn mid-range singing of Mandy alternates with the deep gutturals of Greg. 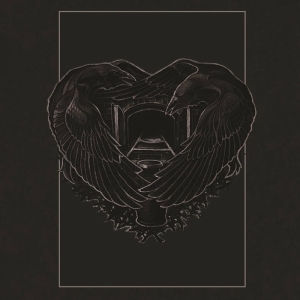 Because of the vocal style, the band has been lumped in with the “Beauty and Beast” tendencies of some more Gothic and Symphonic influenced bands. However, I find The Slow Death lacks the romantic and poetic nature to be compared to the likes of Theatre of Tragedy or Draconian. Rather than romanticism, the musical direction taken here is apocalyptic, oppressive, and utterly devastating, as a Doom band should be. However, final track 'People Like You' is a bit more relaxed and atmospheric, featuring a consistent sluggish pace and the mournful crooning of Mandy. 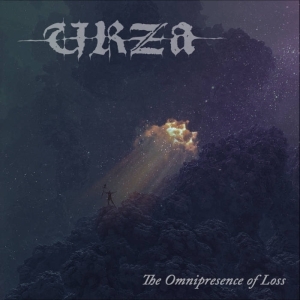 Much in the vein of Omit, this grandiose closer simply proves the point that being emotionally heavy doesn’t always have to equate to being sonically crushing. It’s the first song by the band to not feature harsh vocals, and has the same ethereal nature as 'To Your Fate' from their 'II' album. As a big fan of this project, I feel that The Slow Death have done a good job of personalizing their sound a little better, and their progression can definitely be noticed here. Overall, I am very pleased with this split. Though neither of the projects are groundbreaking, they are still distinctive and don’t sound too much like any other band. While Majestic Downfall makes for the grittier and more energetic side of the split, The Slow Death balances it out with their more primitive and emotional style. As a whole, fans of mid-90s Death/Doom Metal will want to seek this out.